Kartana in game: 1,012 Who? Important notice! Pokemon Kartana is a fictional character of humans. Kartana (Japanese: ????? Kamitsurugi) is a dual-type Grass/Steel Pokémon introduced in Generation VII. It is one of the Ultra Beasts and is known by the code name UB-04 Blade (Japanese: UB04 Slash). 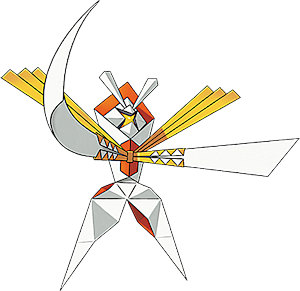 Kartana is a small, humanoid Pokémon that resembles origami. It has a mainly white body with a red underside, with its head seemingly folded inside of its body. Its head has a four-sided star in the center that functions like a mouth and two horns or antennas protruding from the top. No discernible eyes or other facial features are present. It has long, thin arms that resemble katanas, which connect to the center of its body through a yellow sheath-like area. It has three yellow protrusions by the sheath, and its legs appear creased. Its body is completely flat, as if it was made entirely out of paper. Despite its small size compared to the other Ultra Beasts, Kartana is extremely dangerous, as every edge of its body is impossibly sharp. It is able to cut down a gigantic steel tower with one stroke of the blades on its arms, and any opponents that try to attack it will be similarly cut apart. Its light, paper-like body allows it to evade most attacks by simply floating out of the way, but it also makes it highly vulnerable to fire and moisture. Kartana is the only Pokémon that can learn Cut by leveling up. Kartana has the highest base Attack stat of all Grass-type and Steel-type Pokémon. It is tied with Ferrothorn for the highest base Defense stat of all Grass-type Pokémon. At 0.2 lbs (0.1 kg), Kartana is tied with Gastly, Haunter, Flabébé, and Cosmog as the lightest Pokémon. 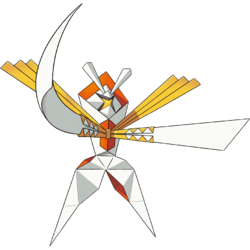 Kartana may be based on origami and samurai. In particular, it bears resemblance to noshi, a ceremonial origami attached to gifts for congratulatory occasions, as a token of good luck. It may also draw inspiration from paper cuts, given its codename and that the vast majority of its moveset involves blades, cutting, and slashing. Kartana may be a combination of katana and art or charta (Latin for paper). It may also incorporate the name Curtana, the British ceremonial sword used at the coronations for kings and queens, or kartana, a Sanskrit word for "cutting."